Sgraffito, Slip Trailing, and Painting. Engobes are either natural clays or a mixture of clays and ceramic raw materials, and are typically rich earth colors and subdued tones. Only water is added to obtain a working consistency like thick cream. Engobes may be brushed, poured, or trailed thinly on wet or dry greenware. Sometimes they are used to cover an inferior body, but generally are applied as decoration to contrast with the color of the clay piece. Slip painting, slip trailing and Sgraffito are especially good decorating methods for engobes. For best results when slip painting, use short brush strokes. The designs should be compressed with direct strokes of the brush which is heavily loaded with the engobe. More elaborate designs may be made by the slip trailing method. Try decorating with the AMACO Slip Trailer to produce thin and thick line designs. When the Sgraffito process is used, designs are scratched into a layer of engobe so that the color of the clay shows through. When used for decorative ware on stoneware and left unglazed, most of them have a smooth matte or satin finish, except SE-701, 720, and 740. These will have an irregular surface at Cone 5-6. Any Continental Clay dry or moist pottery clay may be decorated with AMACO Engobes and fired to the maturing temperature of the basic clay. Usually, a clear transparent glaze for unique effects is applied over the entire decorated shape. Amaco Engobes are available in dry form in one pound jars. 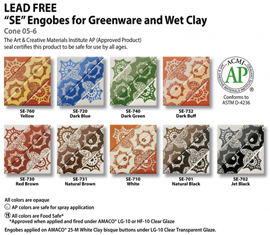 AMACO Engobes have only been tested and approved as dinnerware safe when applied and fired under LG-10 Clear Glaze. They should not be used on surfaces which come in contact with food or drink. If left unglazed, AMACO clear glazes LG-9, LG-10, F-10 and HF-9 or any other dinnerware safe glaze are recommended to be used over AMACO Engobes to make them dinnerware safe. These Amaco Underglazes are all AP Non-Toxic..